(MENAFN - DailyFX) The Euro is on the verge of breaking significant support, which could have meaning but don't count on it just yet as it looks poised to bounce first. Despite a stronger Dollar gold is maintaining support, continuing to give its techs merit on their own. Crude oil nearly posted a meaningful lower low yesterday before reversing to keep its technical posturing tentatively bullish. Technical Highlights: EUR/USD thoroughly testing significant support Gold is holding support in face of Dollar strength Crude oil hold of support keeps bid in place See where our team of analysts see your favorite markets and currencies headed in the months ahead on in the Q1 Trading Forecasts. EUR/USD thoroughly testing significant support The Euro is pushing towards a breakdown of support in the 11300/11267 zone. It is already trading below the lower parallel off the November low. The break will need to be convincing and given the slide is over a week old without a bounce, risk is for a snapback. To get geared up from the short-side a solid break and failed recovery is needed. As discussed yesterday, volatility in the Euro is due for a sizable uptick and while we may be on the cusp of that, trading conditions could still remain range-y for a little while longer. For now, laying low and waiting to see how any bounce from here might develop. 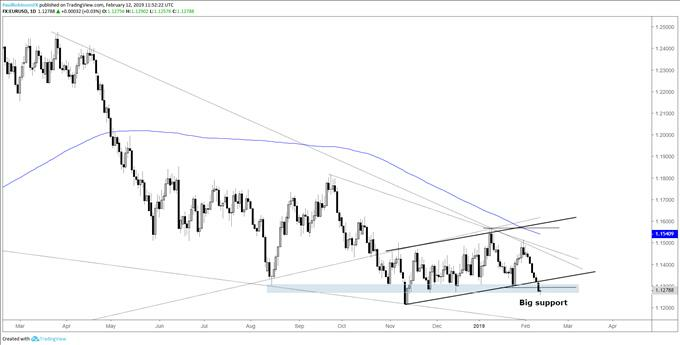 EUR/USD Daily Chart (thoroughly testing support) Check out the Q1 Euro Forecast to see our analysts' intermediate-term fundamental and technical outlook. Gold is holding support in face of Dollar strength During the Dollar's week-long+ rally gold has held its ground, putting up a fight in the 1310/05 band penciled in as support. Indeed, on its own technical merit gold is acting well in-line with the broader uptrend. Holding support and doing so in the face of a decent ascent by the Dollar bodes well for higher prices. As long as it doesn't drop below the support zone and trend-line off the November low, look for gold to attempt a run at a new swing high above 1326. Gold Daily Chart (hanging onto support) Check out the Q1 Gold Forecast to see our analysts' intermediate-term fundamental and technical outlook. Crude oil hold of support keeps bid in place Crude oil was in danger of breaking support yesterday, but the WTI contract managed to mount a bit of a reversal day off support near the Jan 28 low at 51.14. This helps keep a floor in crude for now and positions it for an attempt to advance again. If risk appetite in general can remain steady, then look for crude to maintain a bid. If, however, stocks begin to fall with vigor then pressure is likely to come on oil as well. But in keeping things simple, stay above 51 and the outlook is neutral to bullish. Crude oil Daily Chart (posted smallish reversal day) Check out the Q1 Crude Oil Forecast to see our analysts' intermediate-term fundamental and technical outlook. Resources for Forex & CFD Traders Whether you are a new or an experienced trader, DailyFX has several resources available to help you; indicator for tracking trader sentiment , quarterly trading forecasts , analytical and educational webinars held daily, trading guides to help you improve trading performance, and one specifically for those who are new to forex .